A rare moment of self doubt for the big man? Probably not. Image: FRANCK FIFE/AFP/Getty Images. Dynamo Kiev twice came from behind, but a decisive second goal from Porto’s Jackson Martinez ensured that the Portuguese pocketed all the points in last night’s hard fought fixture to stay top of the group. Big Zlatan made it onto the score sheet once again in Paris St Germain’s 2-0 away victory at Dinamo Zagreb; a Matchday 2 defeat against the group leaders the only thing separating the Parisians and the Portuguese. Zagreb are bottom, and, as we writers are allowed to say in such circumstances, utterly pointless. It’s been nine years since Arsenal suffered defeat at home in a Champions League group game, so Gunners fans would have been counting on victory vs. Schalke 04 to take their collective minds off last weekend’s league defeat to Norwich City. For a while it looked plausible, but Klaas-Jan Huntelaar & Ibrahim Afellay, for possibly the first and last times in their respective careers, emulated Grant Holt and scored record (and heart) shattering goals. Arsenal have the away fixture at Schalke, plus a home game vs. Montpellier to come in November, and will be hoping that last season’s Ligue 1 winners’ hangover will continue dulling their edge until then. Montpellier haven’t won a game in Group B yet, although they came pretty close at home to Olympiakos last night, taking the lead just before half time before seeing their advantage cancelled out by two late goals. They’re bottom. 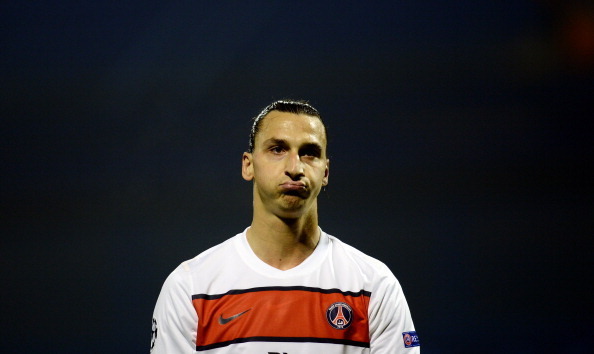 We don’t want to contribute to the already zeppelin-sized ego Zlatan Ibrahimovic floats in above European football, but AC Milan sure are missing him this season. The Rossoneri lost 1-0 away to Malaga last night, and while their win vs. Zenit St Petersburg in the last round kept their heads above water in the group, that may not be enough to save Massimiliano Allegri’s job. Given that their 1-0 victory over Anderlecht last night was their first of the campaign, Zenit are probably quite chuffed to be just one point behind Milan. November’s reverse fixtures favour Zenit over AC Milan; the former will back themselves against Anderlecht away, while the latter, on current form, are more likely to back themselves into a no parking sign than win against Malaga at the San Siro. Although stranger things have happened. 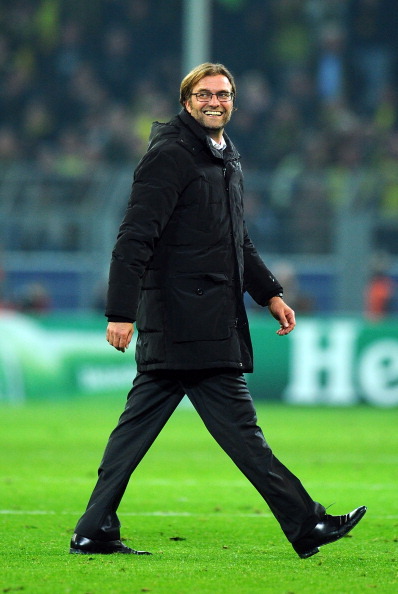 He won’t be grinning like that if Mourinho turns up in his laundry basket. Image: Lars Baron/Bongarts/Getty Images. The Group of Death (and Doom, but mainly Death) was always going to be a challenge for Roberto Mancini’s men, but one point from three games isn’t going to win you anything but a wooden spoon. City lost 3-1 to an efficient and organised Ajax side who until last night had been the group’s anticipated whipping boys. Seems like the entire City squad will be wearing the Dunce hat for a while, not just Mario Balotelli. According to Jose Mourinho, “some of [the groups] are a joke, but this is the group“, so while he’s not thrilled with Real Madrid’s 2-1 defeat at Borussia Dortmund, he’s not ready to poke anyone in the eye either. Sergio Ramos is relieved. Shaktar Donetsk’s unbeaten record goes back further than Chelsea’s tenure as European champions, but that will be of little comfort to Di Matteo’s team after a 2-1 defeat at the Donbass arena on Tuesday. Not only did they ship valuable points, but face a worrying wait after Frank Lampard suffered a recurrence of a calf injury. There was a brief glimpse of the luck that brought the Cup to Stamford Bridge last season though. Juventus failed to beat Danish champions Nordsjaelland, a late Mirko Vučinić goal cancelling out Mikel Beckmann’s glorious free kick. As a result, Chelsea remain in second, and if they can squeak a result away at Juve, they may just avoid the ignominy of being the first holders to exit the Champions League in the group stages. Apart from Lille, who are now relying on a Wigan Athletic style late run (or a ruddy miracle) to qualify, there’s little to separate Group F. BATE Borisov’s astonishing Matchday 2 victory over Bayern Munich was cancelled out by a 3-0 defeat to Valencia, Roberto Soldado’s hat-trick sufficient to lift them to the top on goal difference. Bayern have finally brought their imperious league form to Europe, although a narrow 1-0 victory over Lille wasn’t enough to push their goal difference into positive figures. They’re currently third, but will be looking to capitalise on Lille’s woes when the two meet at the Allianz Arena on Matchday 4. Even Giorgos Samaras looked confused when Celtic took the lead at the Nou Camp. Image: Jasper Juinen/Getty Images Europe. Not many people outside of Glasgow were predicting anything other than an utter drubbing for Celtic in the Nou Camp, but such was the Hoops’ heroic stubbornness, by the time Jordi Alba made his renegade run into the box and scored the last minute winner for Barca, there were few who didn’t feel gutted. Fairy tale over, Barcelona’s perfect record stands but Celtic’s historic win vs. Spartak Moscow in the last round keeps them in second for the time being, although needing something from the Catalan’s visit to Celtic Park in two weeks is not ideal. Spartak beat Benfica 2-1 on Tuesday, and like Celtic, Benfica might have to kiss hopes of qualification buh-bye if they lose their reverse fixtures. Manchester United can also boast a perfect record to date, although they emulated their league form this season by doing it the hard way against Braga. At 2-0 down after twenty minutes it didn’t look hopeful, but Javier Hernandez responded to speculation that he might be on the move by scoring two, while Johnny Evans added to his season tally in between. Meanwhile, Galatasaray failed to capitalise on the initiative offered by their home support, drawing 1-1 with Cluj. The Translyvanians are perilously close to qualification & a sceptical SideEye editorial dept is convinced that TV and radio producers are gleefully dusting off their vampire gags in preparation.